As I mentioned earlier, I figured out my issues with my Garmin Edge and Forerunner dropping speed and distance mid-ride. When either device's GPS accuracy drops below a certain threshold, it switches to the cadence/speed sensor for distance/speed; however, if the speed sensor isn't working then the Edge/FR thinks you aren't either. If you have the GSC 10, then you'll know that you can test the magnet location by pressing on a little white button and it will flash red/green for a second. You then turn the pedals/wheel it will flash red as the cadence sensor is tripped and green when the wheel speed sensor is tripped. Mine? Well, it would only flash red when pressed. Then as I turned the wheel, it wouldn't turn either. I could take the wheel magnet in my hand and pass it up and down the sensor with the magnet... nothing. I could hear it tripping something in the unit but no green light. When I ordered my new tri tank and shorts from Amazon, I threw in a cadence/speed sensor into the digital shopping cart. The box arrived just in time for my trainer ride Wednesday. I pulled off the old GSC 10, got everything out of the box with the new one, and placed it on the bike with loosely tightened zip ties. I carefully lined up the wheel magnet and started turning the wheel. What the heck! Are the wheels on my bike some magical demagnetizer? I took put the magnet in hand and waved it over the sensor. Am I crazy? Well, maybe I am. So I do something a crazy person would do. I grabbed the old sensor laying on my floor. Hit the button and waved the magnet over it. GREEN! Yep. Take off the old sensor and put it right back on. I don't think that is in the directions. Fortunately, there were enough zip ties in the package that I was able to get the NEW sensor attached. Good thing I took better care of laying out the parts when I replaced the garbage disposal today. (However, next time I replace a garbage disposal I will make sure I tighten it to the flange under the sink better so it won't FALL OFF while I'm testing it). I think it fits me quite well, don't you? ... and the new shades!! I wore the tank today on my 40 mile ride with Joe VI and it worked pretty well. The back is much longer than my red tri jersey (so no funky looking sunburn tramp stamp). The material is much tighter so I don't expect it to ride up too much but I guess I don't care. It's what comes with the territory of being a tall tri guy. Volleyball: We won the match! 4 weeks down and 14 to go! Recovery week! Only logged 84 miles this week and I tried to get 8 hours of sleep every night. I was successfully 3 times. I tried to get a couple naps in Saturday (not too successful) and will plan on one today. Sleeping was hampered by the hot temps. We hit 100 degrees every day this week and so I left the alarm to go off at 4am. I think I figured out my issues with my Garmin devices losing distance/speed while on a ride. On Saturday's 30 minute ride this happened on me while on a long downhill. This means I was in the aero position which puts my physical body over the Edge 800, likely reducing its ability to "see" the satellites. With reduced visibility it switched to the speed/cadence sensor. I've noticed that the speed/cadence sensor hasn't been working correctly in not picking up the wheel magnet; therefore, not recording speed. I don't know if it is broken or the battery is on its way out. Considering the speed I'm traveling, I think the Edge 800 has trouble reacquiring satellites. I turned off the the speed/cadence sensor and it started working. So I'm going replace the battery and, if that doesn't help, I'll replace the speed/cadence sensor. Went to the doctor this week and got the thumbs up on another year of living. Last year he was concerned about high blood pressure but this year he said it was fine. Sweet! I've been wanting to get back to the weight room, at least for some core workouts. Week 5 is when I had planned to do that. We'll see if that happens. I've been looking at buying another tri top and tri shorts to have on hand. I've been using Pearl Izumi but think I'm going to give Orca or Zoot a try. Orca has a line that is longer in the torso, which is what I need. The Zoot's that I tried yesterday had good length, so I may give them a shot. *BEEP BEEP BEEP* 4:00am.... time to get moving. Out of bed at 4:04am. I had planned a 40 minute run this morning plus 1000 meters at the gym. This is a very doable distance in both regards, partly because of it being a recovery week. Started my run right out the door. The legs complained so I complied, no big hills this morning. They still didn't want to move. They gave in but only to the point of a "Scotty Shuffle" but, frankly, my mind didn't want to push them either. The first ten minutes clicked off without my auto-lap notifying me that I've reached one mile. Awesome.... 10:32. My heart rate was in the zone so I didn't want to push it. What happened? Am I losing my aerobic base? Is my heart rate elevated with overtraining... but it's recovery week! By the looks of it, I was going to hit 4 miles in 40 minutes. Hmm. remember when I ran 4 miles in 26:51? The second mile wasn't much better....10:13. I guess it means I need more sleep. I got a good 8 hours Tuesday nigth but only 5.5 Wednesday. I probably average 5.5. Not good. If I'm going to survive this thing, I need to try to get 8 hours if possible. The third mile had me thinking that this is probably likely because I rode 20 miles at 8pm the night before. Maybe I shouldn't stack the workouts together like that... but trying to #BeatTheHeat. Hmm... starting to get some length in the stride. 9:47... better. Finally getting back into the groove for mile 4: 9:10 but that included 500 feet of sprinting. At least I got some sprints in. I ought to be doing this in 8:00 - 8:30 pace. Oh well. Back home for about 5 minutes before heading to the gym. It's nice living 2 miles from the YMCA. Hopped in the shower to cleanse off (cold) but into the pool (warm.. mmmmm). Went horizontal and started the human-arm-propeller. Hmm... guess I'll hit another 22+ minute swim based on my run. Checked my watch halfway through... hmmm... 9:30. At about 750 meters, I was 14:20. I might do this. Finished my 1000 meters in 18 minutes 59 seconds. This might be the best swim time ever. Things sure can turn around through the course of a brick but I'm glad to have tomorrow as a rest day. Hopefully I can hit 8 hours of sleep tonight and Friday night, assuming my work pager doesn't go off at 1:00am.... again. Planning a 30 miler for Saturday! With 2011 being my year of Triathlon, I had decided that I would not have the time to train for a marathon, both mentally and physically. 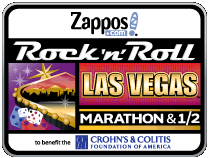 Well, that was until my sister-in-law, Rebecca, talked about doing the Las Vegas Half-Marathon on December 4, 2011. Hmmm.... participate in the world's largest night time marathon? Yeah, we'll make it happen. Since all our money has been sunk into triathlon gear, I don't have to worry about losing it on the poker table. In less than two weeks we had gone from having a free December to having the entire trip (registration, plane, hotel) paid for. I like how Rebecca rolls! So the training? Well, Rock'n'Roll Las Vegas (RnRLV) is five weeks after my half-ironman. I know I can handle a marathon with my cardio system but physically pounding out the 26.2 miles on the legs might be a little more challenging. I decided to take Hal Higdon's marathon plan and compare the long runs to my Half-Ironman plan. They actually matched up pretty well except for about four of the weekends in which I'll need to add another 30 - 60 minutes. I'm not concerned about the midweek runs on the marathon plan until after October 29. First week of Half-Ironman Training is in the books! It went very well and I'm excited to see things progress into week two. The end of Week 1 was completed while on vacation at Pomona Lake and I was just as excited to continue my training there due to the history I have with that lake. I had planned a bike ride around the lake for Sunday but ended up seeking a route that kept me on paved roads. The weather was nice due to the oncoming rain showers, but I kept dry (at least from external factors). On Saturday my brother and I went for a run to satisfy the 50 minutes I had planned. We took a stroll through the old campground where I learned to ride a bike (Thanks Uncle Roger!). It's an old boat but it's in great shape. Love it! On my way back to the campground on the bike I did a flying dismount and now realize there is an unsafe dismount speed. While I stayed on my feet, my bike wanted to take off on me and I practically crashed it. Oops. Need to learn more control there. A few weeks ago I lost my sunglasses. I was kind of bummed out because they are prescription, so I can't just pickup a new pair easily. I took my lunch on the road Monday and ordered a new pair at the eye doctor. I like these because they should work better during training/racing as they wrap around my head a little closer to cut out the wind. I hope to have them before the Shawnee Mission Triathlon on July 10. These might not be the exact same pair. They are actual for motorcycle riders. The foam "seal" around the inside can be removed. Had a great time with Mark on Wednesday doing some bike training at Shawnee Mission Park. We are both participating on the Triathlon on July 10, so it was good to get some time on the actual course. I'm a little shocked at my mileage. This is the most miles I've ever done and it's only week 1! I am keeping track of my blood pressure to make sure I don't see any spikes to help determine overtraining (and to be a good patient since that's what my doctor has asked me to do). I have another race added to my schedule! I'll announce it here this week but if you follow me on twitter, you already know!